Originally the church was C11 and probably cruciform. The tower and north arcade are late C12 and the chancel and chapel are C13. A large C15 roof covers the nave and aisle in one. 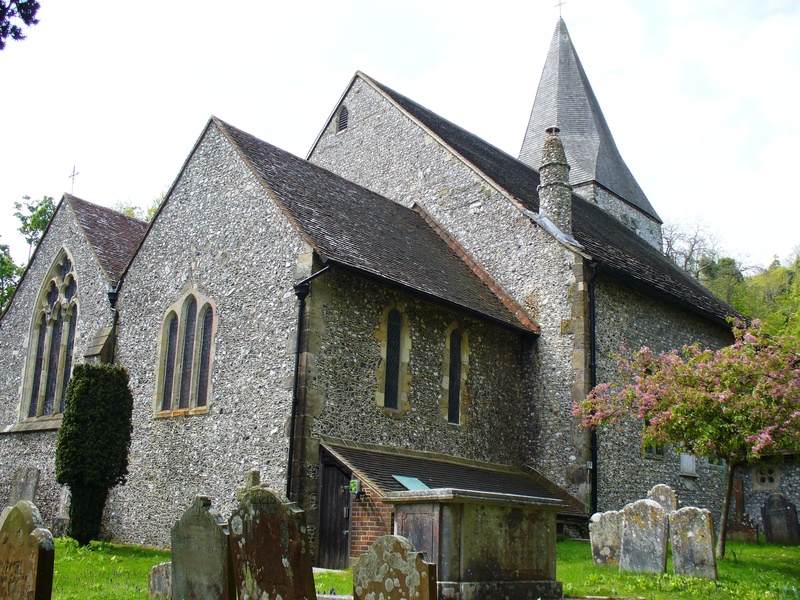 Findon church stands on a wooded slope away from the centre of the village and above it. 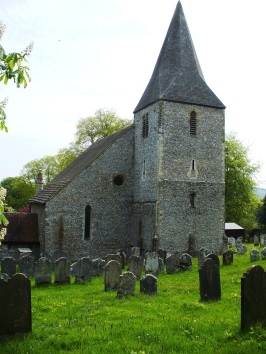 The village was in its present location by the C17 (3 p252) though before the construction of the bypass it was more closely linked with the church. 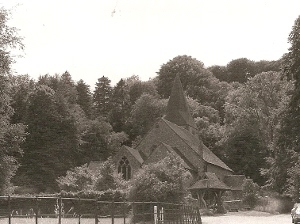 The church is close to the Georgian manor house and the vicarage was formerly close by also (5 p248). The church is mentioned in Domesday Book (13,11) and the oldest parts of the present one probably existed by then, for the north wall of the nave is only 2ft 01/2in thick and part of the west wall of the north aisle is also thin (3 ibid). This need not indicate a pre-Conquest date but is consistent with C11 work. Holmes (see 3) suggests that, since the arcade cuts into the paintings on the aisle side of the north wall (showing them to be older), the nave may have been where the aisle now is, with a chancel on the site of the north chapel. The west and south walls of the present nave are 3ft thick and thus later, but there is what may be the jamb of a small round-headed window high in the south wall. However, the south transept chapel also has the high proportions associated with C11 work. 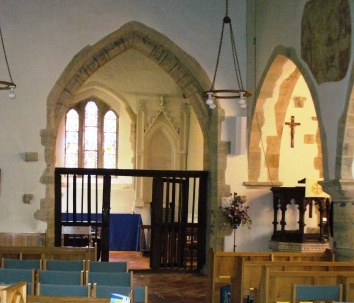 A blocked round-headed arch in the east wall must have led to a chapel, possibly apsidal as formerly at New Shoreham. Godfrey differs in suggesting there was a C11 cruciform church, of which the north transept became the eastern part of the aisle, hence its width. He also cited the thicker east wall and part of the north one of the present aisle (2 p84). The late C12 north arcade has broad unchamfered arches and square abaci on round piers and the arch to the south transept is of the same date, though the abaci are renewed. Ian Nairn, on the assumption that the first nave was on the site of the present one, suggests the aisle was initially narrower (BE p222), but the round-headed north doorway and lancet, with a rere-arch lacking a scoinson, are no later than c1200, so, unless they are reset, which is unlikely, they show the aisle was always this wide. The nave was certainly in its present position by c1200, for that is the date of the tower at its west end. It has small clasping buttresses, narrow single openings and a low chamfered tower arch. Before considering the later changes, it remains to take stock. There are two incompatible hypotheses about the early form of the church; either it was aisleless, aligned to the present north aisle or it had a cruciform plan centred on the present nave, of which the south transept survives with part of the north one, now the eastern part of an unusually broad aisle. The wall paintings are too faded to offer definite evidence. On balance, the hypothesis that the original nave was relegated to an aisle is less satisfying, as it goes against the usual pattern of adding an aisle to an unchanged nave. However, many questions are unanswered and only excavation might answer them. If the present nave marks the original church, it presumably had a chancel, though the present one is C13 with lancets. It had a small vestry, now rebuilt, to the south, which Quartermain shows in 1859 ((W) p104). The detail of the chancel is relatively early C13, for the chancel arch has keeled shafts with spurred bases on the responds, which are chamfered on the west side with stops. 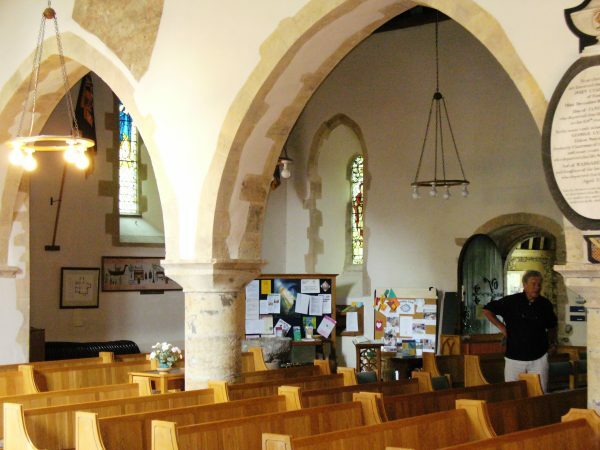 The chancel is smaller than the chapel, which the arches into the aisle and chancel show is later C13; two orders on the head merge without abaci into chamfered responds – those into the chancel are three-sided. In the C14, the chancel received an east window with reticulated tracery and a south one with cusped Y-tracery. Though renewed, they are as Adelaide Tracy (II p8) shows them. She also shows traceried windows in the south transept. 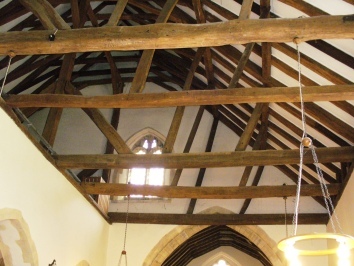 In the C15, as at Ashurst but on a larger scale, the nave and aisle roofs were replaced by one large structure resting on the arcade. Apart from its scale, the crownposts and tiebeams are conventional. Dating from the same time, a large east gable, dwarfing those of chancel and chapel, contains a two-light window with panelled tracery. A south nave window with a depressed head was inserted then or soon after but the similar one next to it is a C19 copy. The tall, shingled broach spire may be of the same date. Nothing is visible of repairs to the tower in 1550/51, when the sum of 4d was left for the purpose (SRS 42 p161), though the long, paired bell-openings shown on the Sharpe Collection drawing (1805) may have dated from then. Sir George G Scott restored the church in 1866-67 (B 25 p518) and though much was renewed, he followed the old lines. The work, costing £2500 (KD 1899), was probably in the hands of his son, George G Scott junior (Stamp p376). The extensive refacing makes the exterior hard to study, though the line of the west gable of the aisle remains visible. 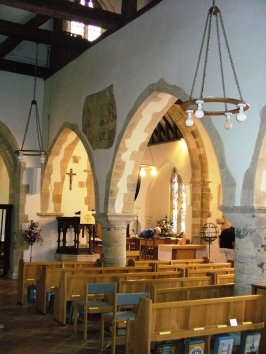 The main roof was retained at Scott’s urging (Foster (ed) Bishop Otter Memorial paper 13 p79) and stripped of plaster; that of the chancel was renewed and the jambs of the chancel arch were rebuilt. Scott replaced the bell-openings on the tower and the octofoil west opening in the nave (WSRO Par 84/4/1). 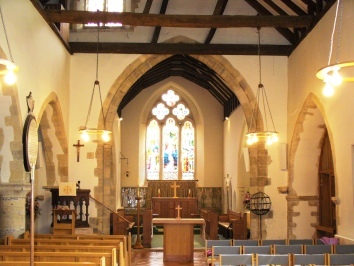 He re-ordered the interior in accordance with current notions of worship, but this was altered again in 1994 by S Reid (CBg 29 p56), who replaced the rotten wooden floor by quarry tiles and the pews by movable seats. Benches: (North aisle) Three plain C15 ones. 1. (Set in the arch in the east wall of the south transept) Possibly a boss. 2. (North of the chancel arch) A corbel in the form of a head, too small to have belonged to the rood-screen. and dated to the C13 (1 p231). It bears traces of paint. 3. (Lower external east wall on south side) This head was first noted in 2013 and lacks its chin, as well as being generally worn. 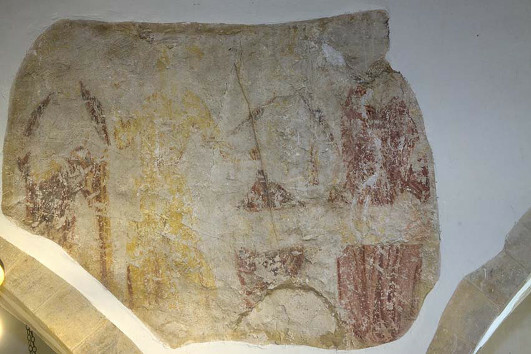 It was probably placed here during repair or restoration work and parallels with C13 or C14 work, especially at Eastbourne, St Mary, East Sussex have been noted (1 p232). Font: A battered bowl on a narrower stem, which has long been in the church and has recently been put back into use. It was at one time in fragments in the aisle and the pieces were dated to c1200 (www.crsbi.ac.uk retrieved on 1/4/2013). This.has been substituted for a C19 marble one, which had four shafts, elegant foliage capitals and a central support, the present whereabouts of which are not known. 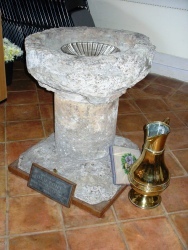 It is said to have been copied from some fragments of the old font though this is hard to imagine. (Information from Nick Wiseman). 1. (East window) Lavers and Barraud, designed by N Westlake, 1866 (www.stainedglassrecords.org, retrieved on 22/2/2013). 2. (North chapel, east window) Lavers and Barraud, c1860 (ibid). 3. (South chancel, west roundel of lilies and north aisle, first and second windows) J Hardman and Co, 1867 (Index). 4. (North aisle, third window) J Powell and Sons, designed by C Hardgrave 1903 (Hadley list). 5. (North aisle, west window) J Powell and Sons, 1928, designed by A F Coakes and G W Read (ibid). Paintings: (North aisle and nave above arcade) Two small areas which have recently been cleaned. As a consequence, the colouring has emerged from the previous dirt, but it remains hard to determine itheir age or subject, though some figures can clearly be made out. It is likely that they date from shortly after the building of the aisle, i e c1200. 1. (Chancel south side) C13 and moulded with an almost triangular head. 2. 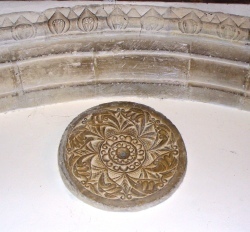 (By pulpit) Plain and possibly C13. Reredos: Tiles by Morris and Co, depicting 12 angels playing musical instruments, a favourite motif that is found elsewhere (4 p190), though the company for certain only produced one other such reredos, that at Clapham nearby. Completed in 1867, its presence supports the involvement of George G Scott junior, who was a great admirer of Morris’s work (ibid p187). A painted reredos by C E Kempe, possibly of 1890, that surrounded it and was designed to match was removed in 1982 (Stamp ibid) and is now displayed at the house known as St Mary’s, Bramber. The present setting of the reredos that followed the removal of Kempe’s work is by L H Parsons. Screen: (West arch of north chapel) Grille-like of c1300 and thus remarkably early despite heavy restoration. Sedile: (Chancel south side) C13 shafted. 2. My thanks also to Nick Wiseman for the photograph of the wall painting and for clarifying the current position of the fonts.